Marrowstone Island is located in Jefferson County near Port Hadlock and Port Townsend, linked to the southern end of Indian Island by a narrow causeway, while a short bridge connects the western side of Indian Island to the mainland, making it easy to reach by car or watercraft. 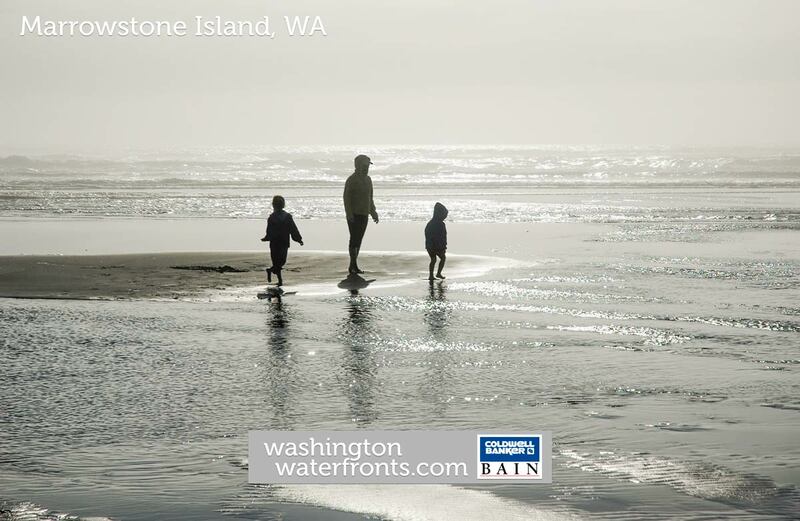 This long and narrow piece of land is filled with parks, including Fort Flagler State Park at its northern end which overlooks Admiralty Inlet and Port Townsend Bay, retaining rural solitude while offering magnificent shoreline and mountain views. While there is little in the way of city amenities, those who own Marrowstone Island waterfront real estate like it that way, though grocery stores, eateries and other services can be found within a 15-minute drive. The island itself is home to the Nordland General Store, popular with boaters and campers, as well as a picturesque winery, Marrowstone Vineyards, which occasionally hosts events like concerts. While many Marrowstone Island waterfront real estate owners can launch their boats or get out onto the water in a variety of other watercraft right from home, Mystery Bay State Park near the general store is popular for kayaking and paddleboarding on the pristine waters of the bay as well as for shellfish harvesting and even scuba diving. Fort Flagler State Park, a former military base features preserved barracks and bunkers along with scenic hiking trails with views of the water as well as Mount Rainier and Mount Baker. Many are drawn to Marrowstone Island waterfront real estate for its protected moorage in both Mystery Bay and Killsut Harbor, with boaters enjoying convenient access to the Strait of Juan de Fuca and the opportunity to watch for a wide range of marine life, including porpoise, orcas, seals and more. Lots of properties include wooded acreage for tranquil seclusion, with a variety of homes, from quaint cottages to more lavish homes. Take advantage of our industry-leading tools to make your property search as easy as possible and be sure to register for a FREE account so that you can receive email alerts whenever new Marrowstone Island waterfront real estate for sale hits the market. If you're seeking to sell your Marrowstone Island waterfront property, contact our Waterfront Specialists directly for a comprehensive listing analysis and to learn more about the cutting-edge marketing strategies we'll use to sell your home quickly for top dollar!